It's brave of a really young actor Shraddha Kapoor to want to play Marlon Brando in The Godfather. And full marks for effort. But Haseena Parkar is a poorly researched film, which just makes you laugh at the end of it all. A caramel quoted version of distasteful reality. 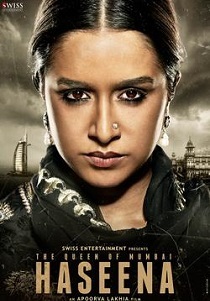 The crime drama fails to offer an insight into Haseena's life whatsoever as an individual, beyond her infamous identity as Dawood's sister, who dropped her bhai's name to settle property disputes, extort money from builders etc. Apoorva Lakhia designs his film primarily as a court room drama where two advocates are cross examining Haseena and some witnesses. Shraddha badnam hui, Aapa tere liye..